This article is about the film. For the railway station, see Miller's Crossing Halt. For the TV episode, see Miller's Crossing (Stargate Atlantis). Miller's Crossing is a 1990 American neo-noir gangster film written, directed and produced by the Coen brothers and starring Gabriel Byrne, Marcia Gay Harden, John Turturro, Jon Polito, J. E. Freeman, and Albert Finney. The plot concerns a power struggle between two rival gangs and how the protagonist, Tom Reagan (Byrne), plays off both sides against each other. In 2005, Time chose Miller's Crossing as one of the 100 greatest films made since the inception of the periodical. Time critic Richard Corliss called it a "noir with a touch so light, the film seems to float on the breeze like the frisbee of a fedora sailing through the forest". Tom Reagan is the right-hand man for Leo O'Bannon, an Irish mobster and political boss who runs a U.S. city during Prohibition. When Leo's rival, the Italian gangster Johnny Caspar, announces his intent to kill bookie Bernie Bernbaum, Leo goes against Tom's advice and extends his protection to Bernie, who is the brother of Verna, who has begun a relationship with Leo – while also carrying on an affair with Tom. Tom tries everything he can to convince Leo to give Bernie up to Caspar to prevent a war; he attempts to convince Leo that Verna is playing him to protect her brother but Leo will not be swayed. After an assassination attempt on Leo, Tom reveals his affair with Verna to Leo to prove that she is dishonest. Leo beats Tom and turns his back on both of them. Tom then approaches Caspar looking for work and Caspar commands him to kill Bernie in the woods at Miller's Crossing to prove his loyalty. Bernie pleads with Tom to spare him, saying "Look in your heart". Tom fires his gun to fake the killing and tells Bernie to run and hide. Caspar assumes Leo's position as boss of the city, controlling the police and using them to destroy Leo's operations. Tom begins sowing discord between Caspar and his trusted enforcer, the brutal Eddie "the Dane" Dane. Upon finding that his men didn't actually see Tom kill Bernie, Dane takes Tom back to Miller's Crossing to see if Bernie's body is there. Tom nearly cracks as they approach the location but they find a body that had been shot in the face and disfigured by birds. Unknown to Tom, Bernie returned to town and killed Dane's lover Mink, who was Bernie's lover too and placed the body where his should have been. Bernie holds this over Tom's head and tries to blackmail Tom into killing Caspar. Tom uses Mink's unknown whereabouts to convince Caspar that Eddie Dane has betrayed him. Dane denies it and Caspar has to decide whom he believes, and whom he will kill. In a rage, he beats Eddie Dane before shooting him in the head. Tom then arranges a meeting with Bernie but sends Caspar instead on the pretext that he will be meeting Mink. Bernie gets the jump on Caspar and kills him. Tom arrives and tricks Bernie into giving up his gun, saying they can blame Eddie Dane, then reveals that Dane is dead and that he intends to kill Bernie in retribution for blackmailing him. Bernie again begs for mercy, saying "Look in your heart" but Tom asks "What heart?" and shoots him. With Caspar and Eddie Dane dead, Leo resumes his post as boss. Verna has won her way back into Leo's good graces and she reacts coldly to Tom. On the day Bernie is buried, Leo announces that Verna has proposed to him and offers Tom his job back. Tom refuses and stays behind, watching as Leo departs. While writing the screenplay, the Coen brothers tentatively titled the film The Bighead—their nickname for Tom Reagan. The first image they conceived was that of a black hat coming to rest in a forest clearing; then, a gust of wind lifts it into the air, sending it flying down an avenue of trees. This image closes the film's opening credit sequence. Because of the intricate, dense plot, the Coens suffered from writer's block with the script. They stayed with a close friend of theirs at the time, William Preston Robertson in St. Paul, Minnesota, hoping that a change of scenery might help. After watching Baby Boom one night, they returned to New York City and wrote Barton Fink (in three weeks) before resuming the Miller's Crossing screenplay. The budget was reported by film industry magazines as $14 million but the Coens stated in interviews that it was only $10 million. According to Paul Coughlin, "The casting of Byrne allows for the psychological assurance, self-confidence and icy demeanour to be physically reproduced in the sturdy and unruffled presence of the tall and lean actor. Tom is 'a man who walks behind a man, whispers in his ear', he is the brains behind Leo's operation, and he is the heartless centre of Miller's Crossing." Although he was a native Irishman playing a lieutenant to an Irish mobster, the Coens did not originally want Gabriel Byrne to use his own accent in the film. Byrne argued that his dialogue was structured in such a way that it was a good fit for his accent and after he tried it, the Coens agreed; Byrne and Finney used Irish accents in the film. During casting they had envisioned Trey Wilson (who played Nathan Arizona in their previous film Raising Arizona) as gangster boss Leo O'Bannon but two days before principal photography began, Wilson died from a brain hemorrhage and Finney was cast. Roger Westcombe calls Finney's portrayal of Leo "perfectly nuanced in a brilliant performance". Finney also appears in rag in a cameo as an elderly female ladies' room attendant. The Coens cast family and friends in minor roles. Sam Raimi, director and friend of the Coens, appears as the snickering gunman at the siege of the Sons of Erin social club, while Frances McDormand, Joel Coen's wife, appears as the mayor's secretary. The role of The Swede was written for Peter Stormare but he could not be cast since he was playing Hamlet. J. E. Freeman was cast and the name of the character was changed to The Dane, while Stormare went on to be featured in Fargo and The Big Lebowski. The city in which the story takes place is unidentified but the film was shot in New Orleans as the Coen Brothers were attracted to its look. Ethan Coen commented in an interview, "There are whole neighborhoods here of nothing but 1929 architecture. New Orleans is sort of a depressed city; it hasn't been gentrified. There's a lot of architecture that hasn't been touched, store-front windows that haven't been replaced in the last sixty years." During filming, the New Orleans police would arrive semi-regularly to assess fines for permits that the film crew had already procured. Joel Coen commented to Premiere during shooting, "They are acting precisely like the cops that we're depicting in the movie, and they don't even care!" Westcombe finds in the opening title sequence of a fedora being blown off its bed of fallen leaves in the forest, a subtle homage to Jean-Pierre Melville's 1962 French crime film, Le Doulos, which ends with the gangster protagonist's fate underlined wistfully by the shot of his fedora coming to rest, alone in the frame, in the soil of the forest floor. Writing in The Atlantic, Christopher Orr sees in the opening scene, in which Johnny Caspar (Jon Polito) confronts Leo O'Bannon (Albert Finney) and Tom Reagan (Gabriel Byrne) "an obvious nod to the opening of The Godfather". Miller's Crossing quotes many gangster films and film noir. Many situations, characters and dialogue are derived from the work of Dashiell Hammett, particularly his 1931 novel The Glass Key. There are some parallels between the two stories and many scenes and lines are lifted from this novel. The relationship between Tom and Leo in the film mirrors the relationship between Ned Beaumont and Paul Madvig, the principal characters of the Hammett novel. Another important Hammett source was his 1929 novel Red Harvest, which details the story of a gang war in a corrupt Prohibition-era American city, a war initiated by the machinations of the main character. 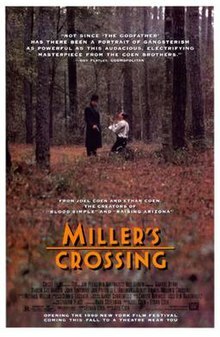 While Miller's Crossing follows the plot and main characters of The Glass Key fairly closely, the film has no direct scenes, characters, or dialogue from Red Harvest. Orr also notes, "The ending of Miller’s Crossing makes even clearer reference to the immaculate final scene of The Third Man: a funeral, a protagonist abandoned by his car, who watches as the last person he cares for in the world walks away down a dirt road hemmed by trees". Miller's Crossing was a box-office failure at the time, making slightly more than $5 million, out of its $10–$14 million budget. It has earned a great deal of revenue in video and DVD sales. The film was critically acclaimed; it holds a 91% approval rating on Rotten Tomatoes and a 66/100 aggregate score on Metacritic. Film critic David Thomson calls the film "a superb, languid fantasia on the theme of the gangster film that repays endless viewing". Of Turturro's performance he says "This could be the finest work of one of our best supporting actors". Roger Ebert gave it 3/4 stars, stating "It is likely to be most appreciated by movie lovers who will enjoy its resonance with films of the past". Miller's Crossing won the Critic's Award at the 2nd Yubari International Fantastic Film Festival in February 1991. It was nominated for the Grand Prix of the Belgian Syndicate of Cinema Critics. Frank Moraes says, "Gabriel Byrne does an excellent job in this film, ... this film lives and dies on his performance". Taking particular note of the work of cinematographer Barry Sonnenfeld and production designer Dennis Gassner, Christopher Orr observed, "Miller's Crossing is an aesthetic pleasure of the highest order on nearly every level". The score was written by Carter Burwell, his third collaboration with the Coen brothers. The main theme is based on the Irish folk ballad "Lament for Limerick". Burwell takes a traditional piece of music with some culturally relevant connection and uses it as the central motif of the broader arrangement. The main theme has been utilized in trailers for a number of other films, including The Shawshank Redemption, as well as in an ad for Caffrey’s Irish Ale. The soundtrack includes jazz tunes, such as "King Porter Stomp", reflective of the era in which the film is set. Other songs include "Danny Boy", sung by Frank Patterson, an Irish tenor, which is heard in Leo's house. Patterson can also be heard singing Jimmy Campbell's "Goodnight Sweetheart" in a scene in the Shenandoah Club. ^ a b "Miller's Crossing box office". Box Office Mojo. Retrieved 16 June 2008. ^ a b c Coughlin, Paul. "Senses of Cinema – Miller's Crossing, The Glass Key and Dashiell Hammett". Sensesofcinema.com. Retrieved 20 October 2013. ^ a b c "Millerscrossing". Crimeculture.com. Archived from the original on 22 October 2013. Retrieved 20 October 2013. ^ Levy, Steven (2000). ""Shot By Shot," Joel and Ethan Coen: Blood Siblings". Plexus. p. 75. ^ a b c Moraes, Francis. (17 March 2010). Miller's Crossing. ^ "Miller's Crossing (1990)". Rotten Tomatoes. Fandango Media. Retrieved 9 March 2018. ^ "Miller's Crossing Reviews". Metacritic. CBS Interactive. Retrieved 9 March 2018. ^ Thomson, David (2008), "Have You Seen...? ", New York City: Knopf, p. 554. ^ "YUBARI INTERNATIONAL FANTASTIC ADVENTURE FILM FESTIVAL'91". Archived from the original on 7 April 2004. Retrieved 19 September 2009.